The element in the r direction is easy to understand. 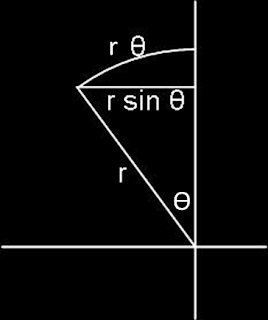 A small displacement along the r direction is represented as dr. The theta and phi displacements might not be as obvious. The graphic to the left illustrates what's going on. With small displacement along the theta direction you're moving along a circle with radius r. The distance you've moved is equal to the length of the arc which is equal to the radius of the circle, r times the small angle, hence, . The element in the in the phi direction is similar to the element in the theta direction in that you're moving along a circle. However, this time you have to keep in mind that the radius of the circle is not r. The r vector is propped up by angle of theta and so, the projection of r on the r/phi plane is , and the distance traveled along the phi displacement is . The next step is to derive the divergence in spherical coordinates. First, we need the differential surface area element in all three dimensions. I don't have a great picture for this yet, so you'll just have to visualize a small square on the surface of a sphere. The surface area element in the r direction is a rectangle on the surface of a sphere with a length of on one side and a length of on the other. So, the element of area is the product of the sides or . In the theta direction, the sides are a small displacement in the r direction and a small displacement in the phi direction giving us . Finally, in the phi direction the sides of the rectangle are a small displacement along r and a small displacement along theta giving us , (. the theta and phi differentials cancel out. You can bring the sin theta term outside of the derivative and cancel it since it doesn't depend on r.
The r and phi differentials cancel. The r can be taken outside the derivative since it is constant with respect to the remaining theta differential. The r and theta differentials cancel and we can bring the r outside the remaining phi derivative. We didn't use the chain rule once, just simple geometry! Dear Blogger, first of thanks for this post, it got me started in the right direction. Solution: You actually skip a step where you should say that the difference in the vector A in the direction of the surface on opposite sides of the box is the infinitesimal difference dA between A(r) and A(r + dr) for instance. In calculating the end result you do the following (1/dr) x r^2 x Ar = (d/dr) x r^2 x Ar. This is a big oversimplication/ error to make. Solution: Use the dA instead from before this way you`ll get 1/dr x r^2 x dA = d(r^2 x A)/dr. I would really appreciate if you responded. Thanks very much for all the info. I think you're correct and it clears up a bit of confusion I had regarding some of the steps. Thanks very much! I'm going to write more when I have time to review what you've said more completely. Thanks again!